« Breeders’ Cup betting: another day of uncashed tickets; is there a “winning system” for the horse races? About 5 p.m. last Sunday (Oct. 26), about two dozen American commandos in four Black Hawk helicopters flew from Iraq into eastern Syria and began shooting and killing people at a building that was under construction in the village of Sukariya in the Abu Kamal area. The attack took place not far from the Iraqi town of Al-Qa’im. In the Syrian capital of Damascus on Thursday, tens of thousands of Syrians protested the U.S. raid on Syrian soil. “Protesters waved national flags, carried pictures of President Bashar Assad and held banners, one of which called America ‘the sponsor of destruction and wars,'” reported Bassem Mroue of AP News. “It will raise questions as to why this is happening towards the end of the current U.S. administration,” Mr. Salem said. “Sunday’s cross-border raid into Syria by U.S. forces serves as a reminder that although George W. Bush is now a ‘lame duck’ president, he still retains the ability to make dangerous waves in the Middle East,” said an editorial in the Oct. 29 edition of The Lebanon Daily Star. An unnamed official of the United States admitted the attack, which he described as “successful.” The official justified the attack on the ground that only militants involved in running weapons, money and fighters across the Syria-Iraq border were killed. The official told Reuters News Agency that one of the dead was Abu Ghadiya, also known as Badran Turki Hishan Al-Mazidih, who was said to have been a collaborator with the late Abu Musaab al-Zarqawi, who was an al-Qaeda leader in Iraq. United States Secretary of Homeland Security Michael B. Chertoff made remarks at a discussion on democracy held in the British parliament in London after the attack that appear to rationalize raids by the United States in Pakistan and Syria. International law must begin to recognize that part of the responsibility of sovereignty is the responsibility to make sure that your own country does not become a platform for attacking other countries. There are areas of the world that are ungoverned or ungovernable but nevertheless technically within the sovereignty of boundaries. Does that mean we simply have to allow terrorists to operate there, in kind of badlands, where they can plan, they can set up laboratories, they can experiment with chemical weapons and with biological weapons? If country X, within its borders, is openly tolerating or incapable of managing a location where people are consistently attacking a neighbor, is it sufficient to say, ‘well, it’s within their sovereign territory, nobody can do anything about it’? I think that’s not true and I think there’s a serious question about whether that’s what the law ought to be. The larger question of the responsibility to make sure your own country is not a platform for attacking others is a matter that needs to be seriously considered in terms of what the law should be. 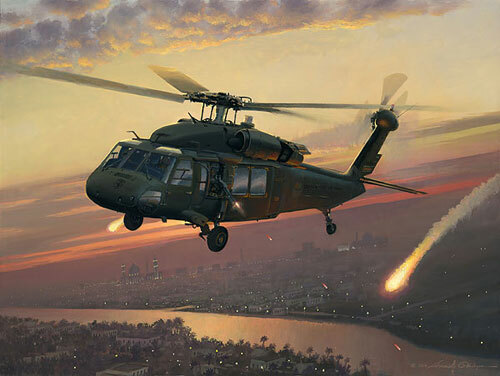 Regardless of whether the raid was lawful under international law, the helicopter raid and killing took place. The body of Ghadiya was flown out of Syria on a U.S. helicopter after the attack, an unnamed U.S. official said, according to an article by Jonathan S. Landay and Nancy A. Youssef of McClatchy Newspapers. Syrian officials disputed the American claims. Syrian Foreign Minister Walid al Moallem (also spelled “al-Moualem” and “al-Muallem”) said seven civilians were killed including a farmer and his three children, a farm guard and his wife and a fisherman. Other accounts said that eight people were killed including four children. Additionally, 14 persons were said to have been wounded. Mr. al Moallem disputed the United States’ apparent claim that the raid was justified because of the threat posed by insurgents crossing the Syria-Iraq border. Villager Jumaa Ahmad al-Hamad told the Associated Press on Monday that he witnessed the attack. He said that after four helicopters landed, “shooting then started ringing out for more than 10 minutes.” After the helicopters stopped firing and left the area, he said that he and other villagers went to the site and discovered the dead bodies of his uncle, Dawoud al-Hamad, and four of his uncle’s sons. About 30 women dressed in black wept in the courtyard of the one-story family home of the late Mr. al-Hamad and his sons, according to a report by Fox News on Oct. 29. They said that the dead were not involved with Al Qaeda. “They were innocent laborers who worked from dusk to dawn,” said a woman named Rima. “All I know is that they went to work and never came back,” said Siham al-Hamad, the widow of Ibrahim al-Hamad, who was killed in the attack. Mrs. all-Hamad is the mother of seven children with the youngest being an eight-month-old girl. A number of American soldiers, some of which spoke Arabic, came out of the helicopters and entered the tent where I live with my children and husband, who works as groundkeeper for the building. The soldiers fired at us for no reason, and then at the workers inside the building, as well as a fisherman who was close by. They then got back on the planes and took off. We went to the place where the raid is said to have happened — a breeze-block compound on the banks of the Euphrates, which flows gently from Syria into Iraq. The compound’s wall was peppered by bullet holes. A villager told me that two helicopters had hovered overhead, firing at the compound. Another two landed, allowing soldiers to dismount. The Americans searched the place, then left, the villager said. It was all over in minutes. A few bullet casing remained behind in the compound, along with scattered shoes belonging to the dead men. Local people were adamant that the men killed were all civilians: builders who had just laid the foundations for a new house, along with a night watchman (the husband of the woman in the hospital). Of the man who was the target of this operation, Abu Ghadiya, there was no mention. While secret policemen and government officials hovered nearby, everyone gave the same version of events: Al-Qaeda was never here; there was no gun battle; this was an American war crime. Five of those killed were from the same family, a man and four adult sons. His widow met me surrounded by 20 or so grandchildren, who were all now fatherless. An elderly male relative angrily denies that the dead men had anything to do with al-Qaeda. “The world must see what the Americans have done here,” he shouted, close to tears, while men from the village nodded in agreement. The Syrian government protested the attack and killings. “This act of aggression perpetrated by the U.S. forces against Syrian civilians indicates the U.S. administration’s determination to go on in its policies that brought nothing but killing and destruction to the region,” said a letter from Syria to the United Nations Security Council. Jihad Makdissi, Syria’s press attache in London, told the British Broadcasting Company that if the U.S. had plans to confront alleged terrorists in Syria then it should have first obtained permission from the Syrian government. “If they have any proof of any insurgency, instead of applying the law of the jungle and penetrating, unprovoked, a sovereign country, they should come to the Syrians first and share this information,” Makdissi said. Washington has repeatedly accused Syria of turning a blind eye to non-Iraqis using its county’s border regions as a safe haven from which to launch attacks on Iraq. But there has been no suggestion that such attacks have increased recently. If, as it appears, this was a punitive cross-border raid by U.S. forces — perhaps designed also to deter others — it would be the first time that American troops were known to have crossed into Syria. As such, it would mark a highly undesirable and risky escalation, just as the armed conflict inside Iraq seems to be easing. “This operation was pretty clearly run by U.S. special operations forces pursuing a terrorist target,” Col. Pat Lang, a retired U.S. military intelligence officer, told Inter Press Service (IPS). “Their sole mission is like a SWAT team to go around and hunt terrorists. Lang said it is not unusual for these special operations to act outside the normal military chain of command. [S]pecial forces are a law unto themselves. They do not take orders, in either Iraq or Afghanistan, from the U.S. commander on the ground. They answer only to the head of SpecialForces Command, who tasks them irrespective of international sensitivities, the effects on U.S. forces in the theatre, or — and of most importance — any consideration of humanity or decency. His orders come directly from the cabal of repulsive fanatics in the Bush administration. Much of special forces around the world is disastrous. They have no rules of engagement; they kill at will; and are not answerable to anyone who does not automatically support their depraved activities. They are shielded by the all-embracing mantra that “We do not discuss special forces matters,” which means, quite bluntly, that whatever they do, no matter how illegal, repulsive and barbaric, is deemed to be proper and totally acceptable by their governments. The operation by special forces in Syria has increased the danger to their comrades in Iraq and Afghanistan. It caused alarm and despair in Europe and vastly increased hatred of America in the Middle East. It ripped up the United Nations Charter and was entirely counter-productive. These people are out of control. But now that the genie is out of the bottle, can they ever be reined in? “The Iraqi government rejects U.S. helicopter strike on Syrian territory, considering that Iraq’s constitution does not allow its land to be a base for launching attacks on neighboring countries,” Iraqi spokesman Dr. Ali al-Dabbagh said on Tuesday. “President Bashar Assad’s government said it was largely freezing high-level diplomatic engagement with the Bush administration for its remaining three months in office,” reported Jay Solomon in The Wall Street Journal on Oct. 28. China, Russia, Egypt, Lebanon, Iran, North Korea and other countries issued statements condemning the attack as a violation of Syria’s sovereignty. China opposes “any deed that harms other countries’ sovereignty and territorial integrity,” said Jiang Yu, a representative of the Chinese foreign ministry. Saber rattling and attacks upon sovereign nations who did not attack us are unacceptable. We must question the timing. We are on the eve of national elections, we must be mindful of the Administration’s past manipulation of security issues in order to influence public opinion. We cannot stand by and let them use the lives of innocent people as pawns in the wrongful political objective. The fact is that Syria’s 1980s army can’t provide a military response to the U.S. operation. As things stand, [President] Assad can only swallow his pride and increase efforts to keep underground fighters away from his borders. But he could also do the opposite and ratchet up the Iraq war to a new level. If that were to happen, the American will have brought about the exact opposite of what they had meant to accomplish. There is evidence of recent planning by the Bush administration of the U.S. attack in Syria. In the Oct. 6 issue of Counterpunch, Paul Craig Roberts reported that “President Bush is plotting with Israel to repeat the disaster [of Iraq] in Syria.” Mr. Roberts noted that the Oct. 5 issue of the London Telegraph reported that the United States is interested in “regime change” in Syria, the Israeli newspaper Haaretz reported in its Oct. 3 issue that the Bush administration asked Israel to recommend a successor for Syrian president Bashar al Assad and the Oct. 5 Stratfor Intelligence Brief reported that Mr. Bush’s National Security Council was considering the bombing of Syrian villages near the Iraq border that may be “the infiltration routes used by jihadists” and to have American special forces conduct operations within Syrian territory. Whether the U.S. action was a snafu or not, the question still remains: Why now? Nobody would deny that there has been a problem for years with jihadis streaming into Syria from all over the Arab world so that they can be smuggled into Iraq. But the fact is that, in the summer, it was the Americans themselves who announced to their relief that infiltrations in 2008 had already gone down by 50 percent. And the Syrians are becoming increasingly more aware of how the demons they have awoken have been turning back against them. Last month’s al-Qaida attack in Damascus, in particular, reinforced that lesson. By now, even the Syrians have become more interested in tightening up their border with Iraq. So why the current escalation? Is this the Bush administration’s way of waving goodbye to Syria? The Bush Administration contends that foreign fighters enter Iraq from Syria, but does this give Bush the right to attack Syria? The biggest number of foreign suicide bombers have come from Saudi Arabia, and you don’t see Bush bombing that country, now do you? Hawks in the Bush Administration have long itched to go into Syria, and now Bush is scratching that itch. The point is, by what right does Bush have to go into Syria? He seems to believe that he has the right to attack any country he wants any time he wants. Ahmed Salkini, press secretary for the Syrian Embassy in Washington, said that Syria had been considering inviting to Damascus Assistant Secretary of State David C. Welch for peace talks involving Israel and Syria and to discuss issues involving Lebanon and Iraq. Indeed, the best that the people of this region can hope for in the final days of Bush’s presidency is that the citizens of the United States will choose a better leader when they go to the polls on November 4. The United States used to be admired around the world for its commitment to noble ideals, but now it is widely feared as a result of its erratic and unpredictable policies. The next president will need to work hard to send a more coherent message — and to restore the country to its former glory. This entry was posted on November 2, 2008 at 9:44 pm and is filed under Syria. You can follow any responses to this entry through the RSS 2.0 feed. You can leave a response, or trackback from your own site. longlive middle east.. Jordan Syria Iran Pakistan China. longlive these 5 powers. allah bless us with power and peace.